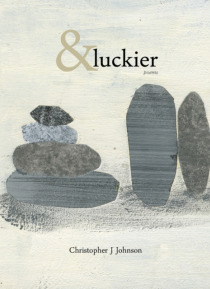 Published by the Center for Literary Publishing at Colorado State UniversityMountain West Poetry Series�In his first collection of poems, &luckier, Christopher J Johnson explores the depths to which we can know our most intimate friends, habits, and-even more so-selves. From a mosaic of coffee cups, dinner engagements, razors, walks around his city, and the wider realm of nature, the poet continua… lly asks to what degree our lives can be understood, our joys engaged with, and our sorrows mitigated. In a voice that is at once contemporary and yet almost primal, these poems seek an affinity with the natural world, the passing of history, and the deepness and breadth of ancestry; they do not question the mystery of life but ask rather how we have become separated from and might return to a more aware place within the frame of it. These are poems rich with metaphor and music but also direct in their voice. Johnson exhibits a poetic tradition that-rather than employing academic allusions and direct personal statements-remains elusive in its use of the poetic "e;I. "e; The reader is never certain if they are reading about the poet, their friends, or themselves.